Here’s a list of 5 free PDF watermarking software for Windows 10 which can be used to add watermarks to PDF documents. Watermarking is a great way how you can protect, at least to some extent, content that you have created. It’s usually done to images, but PDF documents can also be watermarked. Applications from the list down below will add watermarks either to individual documents or to several at once, using the batch mode. Let’s have a look at what kind of features are being offered exactly in these PDF watermark software for Windows 10. Star PDF Watermark is freeware PDF watermarking software for Windows 10. Free version supports text based watermarks only and has limited text customization options. Despite that it did a wonderful job of adding watermarks to my 300 page long test document. Multiple documents can be watermarked at once. To add a document to the processing queue on the right, select the “Add files” option from the toolbar menu up top. A useful feature of Star PDF Watermark is support for creating watermark templates. You can have, for example, “Client 1” and “Client 2” template, each with a different watermark text and formatting. As for the formatting, you can change text size, color, position, outline and more. Like I said, paid license gives you more options. One feature that’s missing in the free version is the ability to add transparency to watermarks, which is quite a shame. 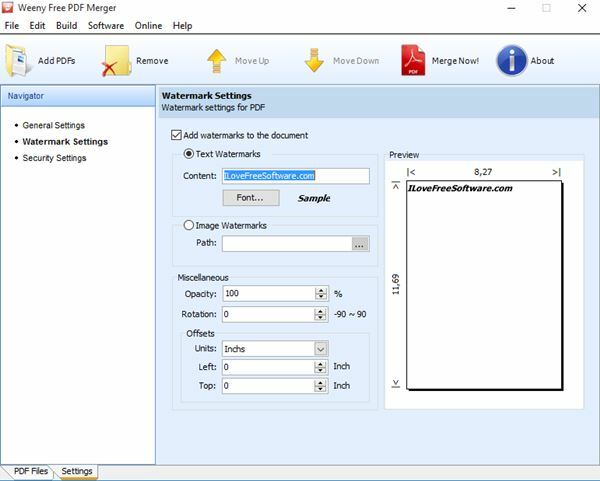 Batch PDF Watermark is a free batch PDF watermarking software for Windows 10. It pretty much has everything that’s missing in the free version of Star PDF Watermark. What I mean by that is it has the ability to use images as watermarks (you can use logos for example) and it has customizable transparency. 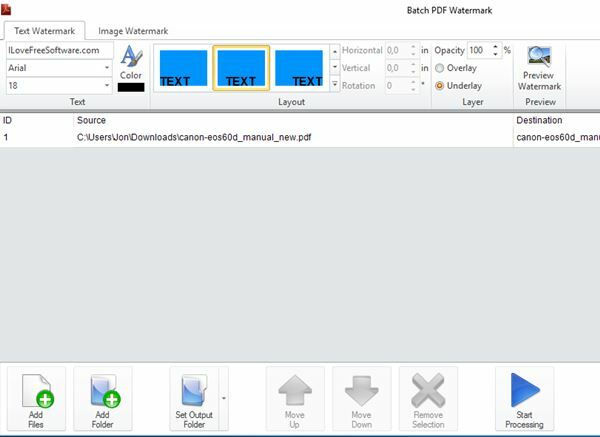 Depending on how you want to watermark your document, you’re going to use either the “Text Watermark” tab or the “Image Watermark” tab all the way in the top left corner. Next select the PDF documents that you want to watermark. They can be selected individually or entire folders at once. Watermark can be positioned using templates (in document corners, center page, diagonally across the document) or you can place it manually (orientation and position). Logo transparency is available and customizable. Watermark previewing can be done, before going through with actually adding watermarks by clicking on the “Start processing” button. Also have a look at PDF Shaper to Convert, Merge, Split and Extract Images from PDF Files. 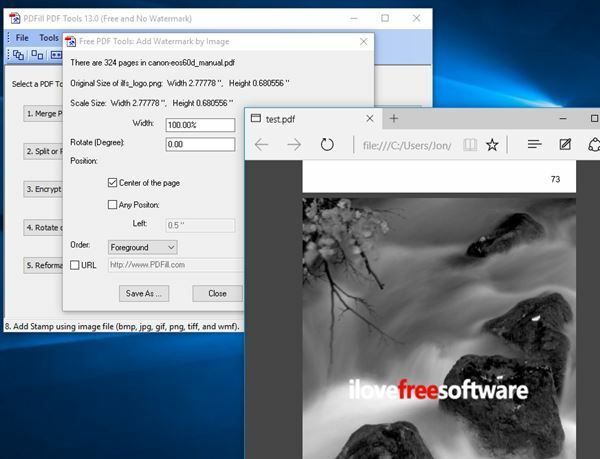 You wouldn’t guess it from its name, but Free PDF Merger is also a PDF watermarking software which runs just fine on Windows 10. Main functionality of this application is merging PDF documents. Watermarking is one of the processing settings that can be applied to documents while merging them. If you don’t want to merge documents, just add a watermark to a document. You need to select a single document instead of multiple documents, and then “merge” it. You obviously won’t be merging anything, just passing the document through Free PDF Merger in order to apply the watermark. As far as watermarking goes, you can use logos, text, adjust positioning, rotation and transparency. 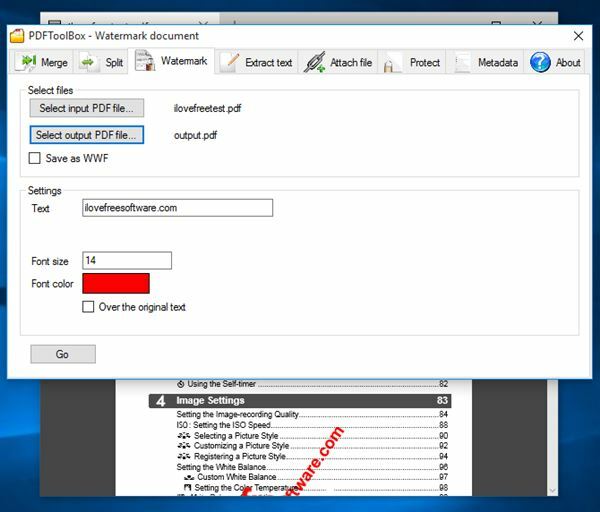 PDFill PDF Tools is another free PDF watermarking software for Windows 10. 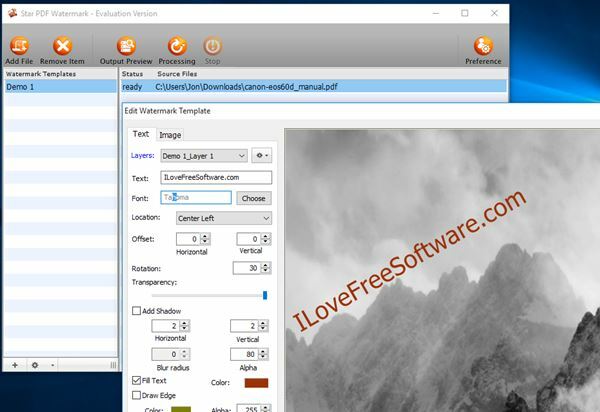 It is another freeware application that offers much more than just watermarking. You can use it to also merge documents, split documents, reorder pages, rotate pages, convert images into PDFs and much more. As far as watermarking goes, application supports both text and image watermarking. It supports BMP, PNG, GIF, JPEG, TIFF, and WMF image formats. Unfortunately there is no batch watermarking and watermarks cannot have transparency. They can instead be placed in the background, behind the text of the PDF document, or over the text. Watermark positioning is customizable (size, position and rotation). Other PDF tools that are available, that I mentioned, can be accessed from the main menu that appears when the application is launched. Also have a look at Split PDF Pages With This Portable PDF Splitter Software. PDFToolBox is another “Swiss army knife” type of PDF watermarking software for Windows 10, which you can probably guess from its name. What I mean by that is that next to watermarking, application also supports PDF merging, splitting, text extraction, file attaching, adding password protection and there’s also a metadata editor. Only text watermarking is supported. There aren’t that many options for tweaking the watermarks. You can only select the input file (single file, there’s no batch watermarking), output folder, watermark text, and font size/color. Lastly you can also select if the watermark is going to be on top of or under the text within the PDF document. Watermark positioning is fixed, diagonally across the page, and cannot be changed. My favorite from the list above would be Batch PDF Watermark. It’s PDF watermarking software for Windows 10 that has everything you need for speedy watermarking, batch processing, both text and image watermarks and it is highly customizable. PDFill PDF Tools is also interesting, because it offers a lot of additional tools. Let me know what you think by leaving a comment down below.